Jeff Young is a third generation co-owner of YESCO signs based in Utah. Will Durham stands next to a piece in his neon sign collection in Reno, Nev.
For the last two decades, Durham, who still lives in Reno, has been collecting vintage neon signs from old, retro-looking motels and roadside businesses — the kinds of places that seem to be disappearing across the desert West. He’s had to rent space to store all the signs — 100 and counting — and his garage is stuffed with them, too. He has to carefully maneuver around to get to a wall plug to light them all up. Among his signs, there’s a creepy clown, a couple of cowboys and a very happy man pulling a lever on a slot machine. 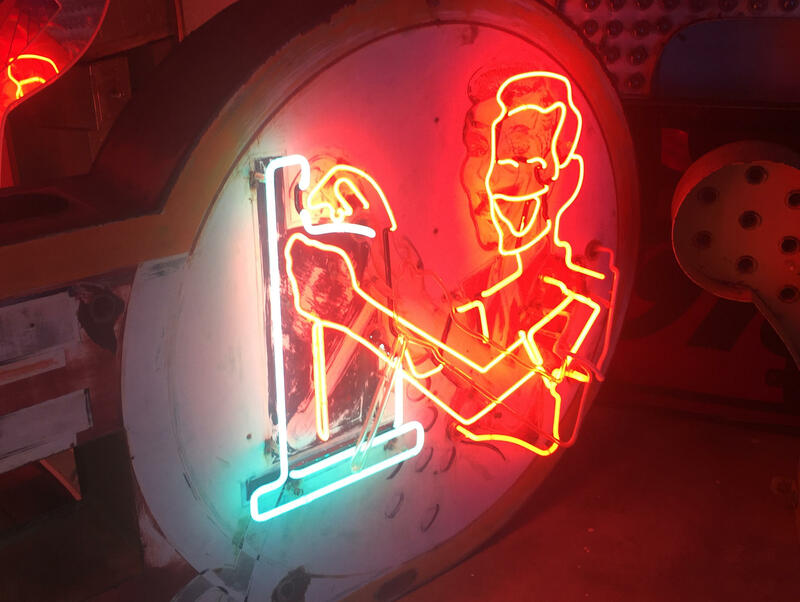 A man pulls a lever on a slot in this animated neon sign from the old El Rancho motel and casino in Wells, Nev. Will Durham now owns the sign as part of his Nevada Neon Collection. “You can see the coins falling, he’s actually winning,” he says. He got that one from a place called the El Rancho in Wells, Nev., and he guesses it's probably 60-70 years old. Durham says there aren’t a lot of companies left doing this type of work, but there is one: the Young Electric Sign Company, or YESCO. He has several of their signs in his own collection. “They’re maybe the most prolific in Nevada, and they've been around a long time," he says. Drive around Nevada long enough, and it’s impossible to have missed the work of the nearly century-old Young Electric Sign Company. That “Welcome To Fabulous Las Vegas” sign that tourists take selfies in front of? That’s YESCO. Reno’s arch? YESCO. The 40-foot Vegas Vic or Wendover Will cowboys with hundreds of feet of winding neon tubing? Also YESCO. 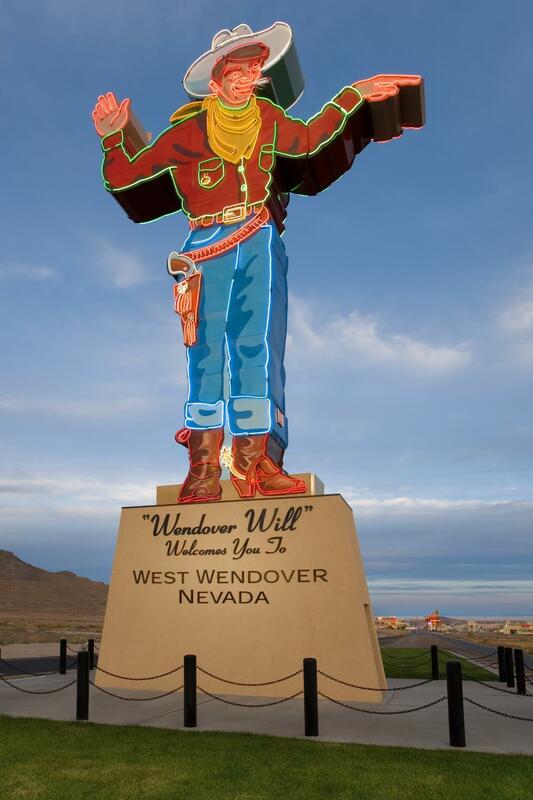 Wendover Will has greeted travelers since 1952 across the Nevada-Utah line. His twin, Vegas Vic, was constructed by YESCO around the same time and still sits on Vegas's Fremont Street. From billboards to office parks to the Las Vegas Strip, the company is one of the oldest manufacturers of commercial signs in the U.S. And although their signs are nearly synonymous with Vegas, they’re actually headquartered here in Utah. Jeff Young is a third generation co-owner of YESCO. It was founded by his grandfather Thomas Young in Ogden in 1920. He gave a tour of their Salt Lake factory last year. In the late 1920s, his grandfather saw an opportunity in a trendy new lighting technology made popular by a French engineer. So he applied for a license and got one of his first commissions: the Boulder Club in Las Vegas, in 1931. Jeff Young and his two brothers now run the business, with more than 100 locations across the U.S. and in Canada. He says people are still surprised with they learn that some of the most iconic signs in Vegas came from a Utah company. You have a fairly clean-cut family and a rather conservative community building the biggest, brightest, flashiest signs in the world. Corey has worked for YESCO for 30 years. He’s often thinking in the third dimension when figuring out how to make a sign into one seamless piece. Dave Corey maps out a pattern for his neon tube at YESCO's neon workshop in Salt Lake. Neon makes up only 10 percent of their business today, and most of that is for servicing and repairing older signs. LEDs are what most businesses want. Not only do they use less power and last longer, but companies can easily program them to swap out their graphics or messaging. Young says it’s also harder to find people who can invest the time to learn a trade like neon, which can take years. 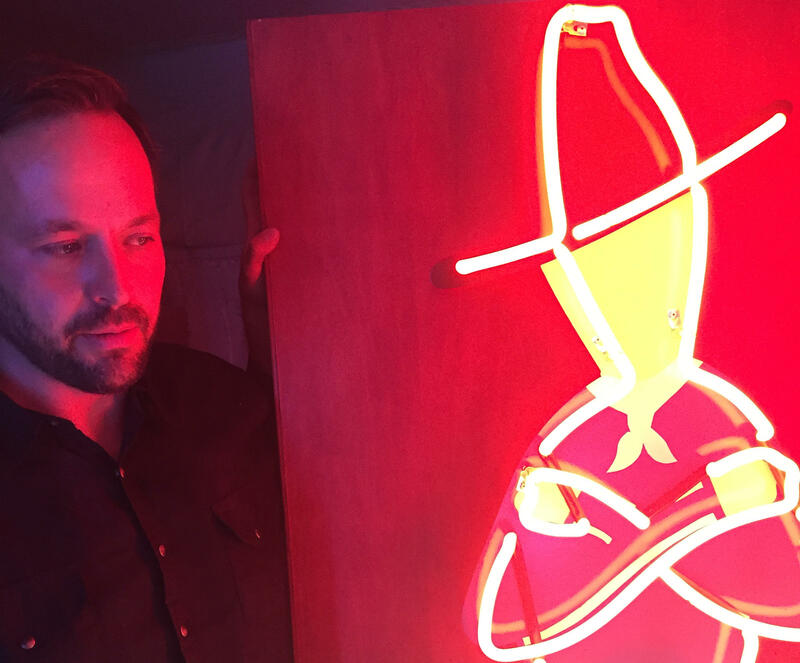 Will Durham, the Reno neon collector, says it’s an artform worth preserving. Part of it is nostalgia, he admits, but aesthetically, neon’s soft colors and sinuous curves are just more pleasing to the eye. He’s currently fundraising in hopes of establishing a permanent home for his collection. You're never going to see these neon extravaganzas again. But that won’t stop Durham from collecting what’s left of them. And it won’t stop YESCO’s Dave Corey from bending away in his small workshop in Salt Lake.